A doozy of a thunderstorm forces the earthy Applejack and the prissy Rarity to bunker down in Twilight Sparkle’s library. Within nothing else to do but wait out the storm, Twilight jumps on something she’s always wanted to do: have a slumber party! Makeovers, ghost stories, pillowflights, and two diametrically opposed friends. What could possibly go wrong? Today I learned everything I need to know about throwing the perfect slumber party! Be sure to enchant your garden hose before the guests arrive. It’s always great fun to see a hose disregard proper physics when your friends try to wash their hooves! If your friends question the cosmic significance of makeovers, scare them into submission with the power of the written word. 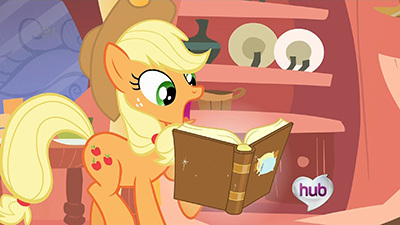 Note that my friend Applejack, the silliest of silly ponies, is reading the words from right to left, while later on I read them from left to right. I love books that include bi-directional text! When you see your friends trading verbal blows, a surefire way to break the tension is to feign ignorance and declare the night the best one ever! You can stop your friends from telling lame ghost stories by pretending like a storm knocked out the lights and then diving into one of your own while they are still startled from the apparent power-outage. They’ll be so scared afterward that they won’t even realize you flipping the lights back on. It doesn’t matter how many s’mores supplies you prepare: you will only ever eat just one. Rarity looks great with her mane down. Seriously. Invite her over to your next slumber party and dump a bucket of water on her head; you’ll see what I mean. If your previous attempts to derail your friends’ verbal blows doesn’t seem to work, suggesting a violent activity is sure to distance them from each other’s throats! You can get out of heavy labor by claiming the proper way of going about it is in a book. Eventually, your friends will do all the work for you. Telling your friends that they won even when they lost always makes everypony feel better about herself. Feel free to use these tips if you ever decide to have a slumber party with Princess Luna sometime. I think after spending a thousand years alone on the moon, she would appreciate the bonding experience! So, yeah, that pretty much sums up my thoughts on this episode. It was eh when I first saw it all those years ago, and it’s still eh today; I think the only thing I got out of it this time around was a reminder of something that gets referenced later on in Season 3 (a fun bit of lore that I won’t spoil for Noel :P). I suppose it’s somewhat of an important episode in that it helps to establish Applejack’s and Rarity’s friendship with one another, but, well… okay, I’m going to have to bust out the shipping goggles. While the AJ/Rarity dynamic is cute, it’s cute in the way dogs and cats getting along is cute: seeing two species that are always at odds with each other get along is adorable, but at the end of the day the dog is still a dog and the cat is still a cat. When looking at friendships between two individuals with nothing at all in common, you find yourself focusing more on what makes them different (divergent attention) than what unites them (convergent attention; I just made those terms up). This is why, for example, I think the Trixie and Twilight dynamics from a few episodes ago and the few AJ/RD run-ins we’ve seen so far (and those we’ll see in the future) are so much more powerful and interesting: each pair shares certain core characteristics (magic for the former, athleticism and headstrong-ness for the latter), so both the characters and the viewers can gauge who is “ahead” at the moment since there’s some semblance of a common metric against which each can be scored. Trying to figure out where AJ and Rarity stand is a lot like trying to reconcile quantum physics with gravity: there’s got to be some way to do it, but it’s an exhausting endeavor. Also, Noel and Tessa: was it just me, or did all the characters sound a tad off in this episode? Their voices seemed higher and less, er, “established” than I’m used to, almost like this episode was voiced before the voice actresses really found their grooves for their respective characters. 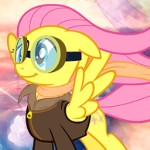 Maybe thunderstorms in Equestria increase the amount of helium in the surrounding atmosphere or something, I dunno. Anyway, I guess that’s about it. 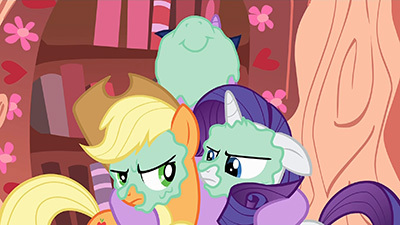 Twilight’s still adorkable, Rarity’s still prissy, and AJ’s still the silliest of all silly ponies that were ever silly. This is another episode that doesn’t really lend itself to a song, so I’ll just have to defer to The Sleep Song from the FiW folks. Don’t worry, next episode spawns a classic tune ripe for remixing! I have no problem with this episode. Nothing at all. There’s nothing to criticize, nothing to plop a big ol’ “Buuuuuuuuut” on, no missed potential unexplored. This is a pretty darn perfect episode. I’ll admit it’s not a stunning achievement or something I’ll go back and revisit time and time again, but I do think it’s a bit more than the “eh” Gerf gives it credit for, yet is still so comfortably, quietly perfect that I can understand where that “eh” comes from. Again, it’s a very simple, by-the-numbers story on the surface, but instead of just playing the beats in the listed fashion, they subvert it by openly reading off the list the characters are trying to follow, and get in the way of the expected tropes as they have to find ways to bond outside the artificial structure Twilight is so eager to impose. This leads to some surprising twists here and there, particularly the climax where their destructive behavior leads to a genuine amount of unexpected destruction. These two had a dispute that has nothing to do with the slumber party, and it’s trappings are just a strip of tape attempting to mask that tear until they’re forced back to the very thing they first fought over and finally settle it. Not by proving who’s right, but that they both have valid worth, as Applejack shows THIS is the reason why the branches needed to be cleared instead of decorated, and Rarity that decoration and cleanliness can sometimes be a more practical way of disposing of things than blunt kicking. When she zapped the huge treetop into a bunch of little pony Bonsais, it not only got a laugh, but was a very clever way of calling back to that opening scene and settling their dispute in a full circle fashion. It initially struck me as a little off that Rarity of all ponies would be helping out with the tree cleanup, but they made it pretty clear that this was a big task involving most residents, and her role here is very much like when she volunteered to help in “Applebuck Season”. She’s out of her element. She’s trying her best in her own way, but it’s still not her element. Which isn’t to say she doesn’t have worth, as the ending shows, but she’s also so locked in her way of doing things that she’s ignoring the worth of those who are in their element. The flip goes for Applejack, who’s so ingrained in how she does things that she not only lacks the patience to calmly teach those lacking her experience, but is so wedge in a box that she can’t think outside it. This is a good way of characterizing these two, much moreso than “You muss up your mane!” “You put on a frilly dress!”, which is a surface conflict of opposites again masking the heart of a deeper issue. This is good writing, and makes for much richer characterization than past episodes where they just crank up the exaggeration of personality traits until a simple lesson is learned and they have to let that trait go for a bit. I think the reason those episode don’t resonate much with me is because episodes like this and “Griffon the Brush Off” show this show is capable of being deeper and more complex, that they can skew tropes instead of wrotely following them, and let their characters build enriching stories simply by playing off one another well. I also like that they just let the remainder of the main cast stay off screen, even Rainbow Dash, who I did expect to be there because of the storm, though quickly remembered her specialty is in breaking storms up, and I kinda like the idea that the weather control bureau needs an entire team to set up what it takes Rainbow Dash only seconds to tear down. Even without appearing, I get some character depth there, even if it’s only in my own mind. And keeping her out of the party keeps Applejack from having someone she can buddy up to, and keeping Pinkie out keeps her from making the party all about her instead of Twilight. I like that they completely isolate it to the core two so the focus can remain on them as they have nobody else to turn to for backup, as well as nowhere to go in retreat from one another, while both try to humor the friend who’s let them in for the night. There is a lovely bit of naivete to Twilight’s hope that rigidly following her book knowledge will resolve the situation, until she’s had enough and tells them to knock it off, and they respond by destroying her bedroom, then figuring it out for themselves. Everybody grows a bit here, including Twilight. And as to her voice, Gerf, I just chalked the higher pitch to her youthful squee at the party, as she settled into her more normal tone when not all giddy. And the broader range of the others I’ll write off due to the broader range we see of their personalities, and, yeah, the actors settling in. I’m still bummed we lost out on the show this series debuted as, but episodes like this still make the show worth while and are what I want to see more of. It’s funny, heartfelt, surprisingly exciting at times, and has rich characters just living their lives in a rich world. And probably my favorite moment is at the end, where just as Rarity starts to take in the mess of mud and branches she’s become through resolving the situation, Applejack quickly jumps in with some eye cucumbers, and Rarity is so charmed by the callback that she tries to hug her friend, but now blind, can only flail her hoof about until Applejack comes in for the embrace. It’s funny, it’s touching, it’s a microcosm of callbacks to the entire episode, and it’s just darn well executed. I really, really like this episode. There’s not much going on in it, sure, but in a way I think that’s part of why I like it. It’s focused in on three of the six main characters and really is just about them being themselves, the conflict arising not from some outside force but the internal one of two ponies being so opposite from each other that having the two forced into the same place for the night is bound to lead to friction. Much as I love the high adventure episodes that come along from time to time, and the goofy off-the-wall slapstick shenanigans that occasionally go on, I think these kinds of episodes are the ones I like the most. The characters are a huge part of why I fell in love with this series, and so just letting them go and carry a story about very normal, relatable everyday things by their own weight is something I genuinely appreciate. I mentioned sort of offhand a while back that I was pretty sure that the other five minus Twilight weren’t all necessarily the best of friends prior to her bringing them all together into the group they became. In “Griffon the Brush Off” we saw the first example of this with a pretty strong implication that Rainbow Dash and Pinkie likely hadn’t spent a ton of time together in the past, and in this one we see the other two who likely didn’t consider each other the best of friends before in Rarity and Applejack. Where the former just needed to give each other a chance to discover how well they gelled together, the latter winds up with considerably more work to come out of it with a stronger bond than before. The two really don’t have a lot of common ground to work from, and their radically different approaches to situations shows pretty much throughout the episode. Like Noel said, I really like that their antics during the slumber party aren’t really even about the slumber party – they’re angry at each other before they even get to Twilight’s house, and are only grudgingly agreeing to stay the night to keep out of the rain, and their patience with each other is pretty much non-existent from the start, with every little thing that they might otherwise be able to brush aside and ignore blowing up into major issues for each other, and both getting their jabs in at the other at every chance they get for the differences that are frustrating them so much. Everything stems from the fight they had at the beginning of the storm, and their bickering during the party is just them drawing out that fight while simultaneously pretending that they aren’t having it. It’s a micro-lesson snuck in alongside the larger moral – simply brushing an issue with someone under the table and attempting to ignore it and pretend like it wasn’t an issue rarely works, especially when you have to continue to be around that person for an extended period of time. It’s something I’ve run into in my own life more than once, and I’m sure most other people have as well. I also really like that neither Applejack nor Rarity are presented as being completely right or wrong in their approaches to the overall problem. At first the leanings do seem to be towards Applejack being the one more or less in the right (as Noel pointed out, Rarity’s very much out of her element with the job), but her stubborn brute-force approach winds up causing the issue in the end. One of the things I love about Rarity (at least, when she’s written properly) is that while she is on the farthest end of the “ladylike” scale, she’s treated equally as seriously as her down-to-earth no-nonsense counterpart on the opposite end of the spectrum (as well as all the others who fall somewhere in between). Her approach may not work perfectly for every situation, but then the same is true for her friends. Neither her way nor Applejack’s way is the “right” way or the “wrong” way to go about things. Both are just ways, and while one might be better suited than the other to deal with certain circumstances, that doesn’t invalidate either one. I love Twilight in this episode. I mentioned last episode that she has a tendency to over-commit to by-the-book plans, often failing to notice things around her not matching up to her expected guidelines, and not knowing how to deal with it when she does finally recognize things going awry. We saw a more subtle version of it last episode, but this time it’s much more on the nose. Twilight has a literal guidebook for running a slumber party and goes through it bit by bit, trying to work through everything it suggests to do and checking it off once it happens. She even very abruptly moves on once she’s satisfied they’ve completed the task – a single s’more gets eaten and she has them all up and move on to the next event. And of course, once everything falls apart and a tree falls into her… tree, she completely shuts down, looking frantically through the book so it can tell her what to do about what’s just happened. There’s something adorable (and also a little sad) in how excited she is to be having the slumber party at all in the first place. In a way, Twilight didn’t have much in the way of a childhood (at least not one involving friends), and now that she actually has proper friends in her life the opportunity to do the kind of thing with them that she’s read about but never experienced has her totally giddy. 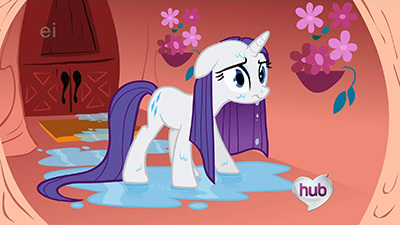 I think it’s very likely that she did recognize that things weren’t quite working between AJ and Rarity all along (her reaction to seeing the two bicker throughout the slumber party sort of lets on that she’s not totally oblivious to the conflict, and her telling the two off towards the end also pretty much implies it), but wanted so badly to have this thing she’d never gotten to have before go perfectly that she’s intent on ignoring it and hoping that going through the steps will just make it work. Yeah, Twilight’s voice is a bit high in this episode, but I pretty much chalk it up to her being so excited at the idea of having a slumber party. She’s getting to be a little kid in this episode, so it reflecting somewhat in her voice actually works for me. I didn’t particularly notice anything off about Rarity or Applejack’s voices, although the “Geronimo!” from AJ as she leaps into the bed actually bleeds into Rainbow Dash a bit (sort of a rare occurrence as Ashleigh Ball is typically fairly good at keeping the two voices separate). I’m sort of spinning off into speculation here (especially with some of the earth ponies we’ll eventually meet somewhat contradicting this), but I kind of wonder how much the difference between Rarity and Applejack’s approaches to problems have to do with the fact that one has magic to manipulate details on things and the other doesn’t. Rarity puts the ingredients for s’mores together delicately and precisely, but it’s not particularly hard for her to do that. 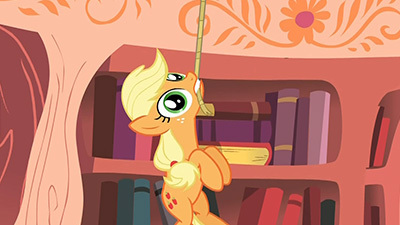 Applejack doesn’t see the point in putting the extra effort in and just shoves stuff together and puts it in her mouth. Rarity puts sheets on her bed perfectly straight and takes care not to mess them up, but again, it’s something she does pretty much effortlessly. Applejack likely doesn’t see the point in taking the time to do that (and presumably it would be much harder for an earth pony to do then a unicorn) and just flops into the bed since the sheets are going to move around anyways. Considering the other earth pony out of the Mane 6 has something of an equal disregard for careful handling of things, I sort of wonder if the reason the higher-class prim and proper ponies have a tendency to be unicorns in the series is because it’s considerably easier for them to show that sort of attention to detail than their pegasus and earth pony cousins. I wouldn’t have gone into this except that Gerf used the shipping goggles incorrectly to try to deny a ship rather than make one (the entire point of shipping goggles is to take innocuous events or words and twist them towards justifying your preferred ship) and it’s driving me nuts, so I’m taking them back and being the resident crazy pony-shipper fangirl again here. Rarity and AJ make for such a fun pairing specifically because of how easily the “Opposites Attract” trope applies to them. While this episode doesn’t fuel the ship on its own, it definitely gives shippers a foundation to work from to build up from here (which gets lampooned rather hilariously in the Friendship Is Witchcraft parody series, in which Twilight has some ulterior motives for getting the two to stay at her place for the night), and more fuel is to be had between the two of them as the series goes on. The two are one of my preferred pairings, and there’s some really cute shipfic of the two of them out there. …why are you all looking at me like that don’t judge me THEY LOVE EACH OTHER VERY MUCH OKAY?